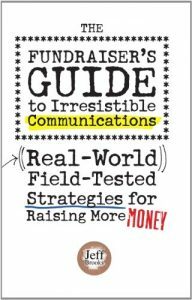 The Fundraiser’s Guide to Irresistible Communication reveals ways of communicating that are proven to motivate donors to give generously, wholeheartedly, and repeatedly. Jeff Brooks, one of America’s top fundraising writers, takes you on a step-by-step tour of the unique strategies, writing style, and design techniques of irresistible fundraising messages. This easy-to-read and entertaining book will help you skip years of learning curve and start writing, designing, and thinking like a seasoned fundraising pro on the very next project you tackle. Whether you’re new to fundraising or a battle-scarred veteran, this go-to resource will boost your confidence, your career, and your revenue. Complements Tom Ahern’s book, Seeing Through a Donor’s Eyes.